George Carlin once remarked on his distaste for America's seemingly slavish fixation with national symbols by stating "I leave symbols to the symbol-minded." This saying has since become a sort of nihilistic credo among apathetic trustees of cultural fatalism as a blanket dismissal of not only objects pertaining to American patriotism, but often any sort of metaphorical expression that touches upon ethical, political or aesthetic pursuits. This was likely not Carlin's intention, and even the most edgy of apathy-mongering hipsters who are nostalgic for his 1992 Jammin' In New York standup to the point of ironically religious devotion will apply this mentality hypocritically, but it stands as a rather telling example of the ongoing cultural decay that had seeped into the American zeitgeist in the 90s. Taking note of the horrid state of the world, then paraphrasing that "Well, whatever, never mind..." saying popularized by rock music's, at the time, supposed savior with a cynical smirk was what the kids were into, and there was no telling them otherwise. But in spite of the anything goes mindset that would seem to logically follow from such an environment, there were two things that were clearly taboo to the newfound ideology of Generation X, and those were any sort of remnant of 80s culture, and anything that sought to pull down the veil of sarcasm and deal with matters in a compelling manner. It may seem ironic that this state of affairs would be the birthplace of one of heavy metal's crowning achievements, but it is always at the story's darkest hour that true heroism is realized. Naturally the American market was largely uninterested in anything that an 80s icon of shock rock and excess such as Blackie Lawless had to say on things, thus the conceptual metal opera that is The Crimson Idol originally sought greener pastures in the European market and didn't even see an official release in the U.S. until well into 1993, arguably when the market was even worse for anything carrying the metal banner. 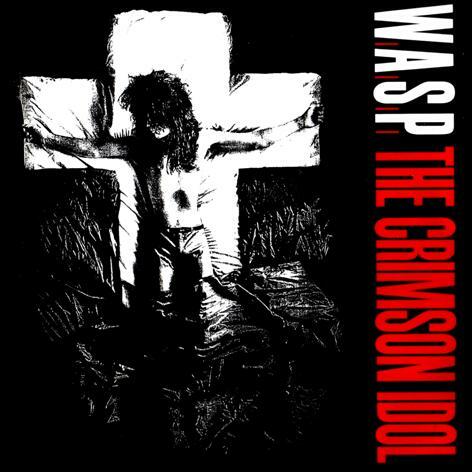 If any trustees of grunge culture at the time took notice of this album, it would have likely been to scoff at the notion of an act like W.A.S.P. going a more serious route in a manner similar to Nirvana's jeering at Bon Jovi donning flannel and a shorter haircut, blissfully unaware of the cautionary tale that laid within for their soon to be dead fad or the musical credibility that it carried, fueled in part by similar influences to those boasted by Kurt Cobain when interviewed on the origins of his style. Then again, persons beheld to such a mentality probably would not have known what to do with the musical content of this massive opus, either from a lyrical standpoint or for the fact that musically this album functions as the perfect synthesis of everything they proclaimed to love and despise about rock and metal's recent past. To anyone schooled in the evolutionary strides of rock and metal music through the 70s and 80s, this album's stylistic origins are immediately obvious, as is the logical progression that emerges relative to its immediate predecessor The Headless Children. The template of both musical and lyrical storytelling dovetails heavily with The Who's rock opera format as employed on Tommy and Quadrophenia, interweaved with folksy acoustic passages that often mimic Pete Townsend's signature style, yet reinterprets them into a far darker and depressive mode of expression. Likewise, the generally jazzy looseness and stylistic eclecticism of The Who's approach is tempered into a far more regimented and tight template, consisting of occasional symphonic and atmospheric detailing, but largely makes up the difference by injecting a metallic sense of aggression and a healthy array of flashy guitar solos to heighten the album's sense of drama. Truth be told, while Blackie Lawless comes dangerously close to being a one-man band here, embodying the musical characters of both Townsend and Roger Daltrey (the latter of whom he shares many similarities), credit should be given to Bob Kulick and especially ex-Lion guitarist Doug Aldrich for picking up the slack of the recently departed Chris Holmes and providing a highly idiomatic and technical set of lead breaks to this massive work. With the blessing of Pete Townsend and the recent success in emulating this album's inspiration via a cover of "The Real Me" on the last album, one might take this album to be a glorified rock album that abandons the intensity of the past four albums for the more nuanced territory of a 70s rock throwback, but this is the exact opposite of what Lawless commits to recording here. Combining some aspects of the more AC/DC meets Twisted Sister sound of the early days with the epic, Iron Maiden-influenced splendor that typified The Headless Children, this album stands as the most logical next step for the W.A.S.P. brand, a fact that was lost on Lawless himself at the time due to its more ambitious character, and continues to be on that of mainstream rock critics who still fail to properly understand this album's nature. On the more stripped down and metallic side of this resulting spectrum stands crushing rockers of passion and angst like "The Invisible Boy" and "Arena Of Pleasure", the latter sporting a wicked chorus riff that sounds like a slightly more thrashing answer to Sabbath's "Neon Knights". Occasionally this more metallic edge smacks up against an older rocking vibe that dovetails with the 70s rock inclinations of the acoustic passages, most notably on "Docter Rockter", which listens heavy and hard enough for early 80s Judas Priest but is sonically comparable to several songs from The Who's early 70s period. Though individually, each song found on this album is quite impressive and can function in a standalone fashion similar to W.A.S.P. 's more accessible early days, this is an album that basically compels the listener to treat it like a book to be read from start to finish. In this light, while the album proves to go a bit heavier on the balladry than anything Lawless had ever put together, there is a utility to every recurring acoustic interlude and the mostly balladic anthems of "The Gypsy Meets The Boy", the extended epic power ballad "The Idol" and the somewhat more sugary yet functional "Hold On To My Heart". The resulting sense of melancholy and longing plays perfectly into the struggle of the central character of this all too familiar and semi-autobiographical tale, creating needed breaks between the points of raucous passion and fury that signifies his angst as he struggles against his "Four Doors Of Doom", a less than subtle nod to the four personalities of the principle character in Quadrophenia. Yet the real brilliance of this all-encompassing conceptual formula is the points of musical climax, namely the brilliant sing-along rocker "I Am One", the galloping Iron Maiden-infused epic anthem to the villainous record executive "Chainsaw Charlie (Murders In The New Morgue)", and the grand finale/tragic end of the protagonist "The Great Misconceptions Of Me" that all but listens like a suicide note set to music. It is often customary for time to be set aside to remark upon the existing flaws or otherwise provide a caveat to an otherwise perfect creation, but such a thing doesn't really apply here. About the only point that could be made regarding this album's presentation is that there was additional material that was cut in order to make it marketable to the average W.A.S.P. fan of the day, material that would have further heightened this album's similarity to its longwinded and vivid forerunner Quadrophenia. However, it only really becomes an issue for anyone who views the original release as lacking due to the multiplicity of supplemental releases that further elaborate on the story such as a collection of b-side single songs and the single/video The Story Of Jonathan that features Lawless doing a 17 minute narration of the album's story in its entirety to the sound of an acoustic guitar recapping interlude material from the album and some creepy atmospheric additives comparable to an Edgar Allen Poe book on tape experience. Nevertheless, the story stands sufficiently strong solely on the lyrics of the 10 songs that ultimately made it onto the original release, and the remnants tend to function more as gravy on latter reissues that largely serve to fill gaps in the protagonist's early life in his abusive home that is summed up on "The Invisible Boy" and recapped at the album's finale. In retrospect, The Crimson Idol was the right album at the right time, not only in a mere musical sense, but also as a stern rebuke against the direction that Generation X was headed with the ascendancy of grunge and the demise of metal as a commercial force in the states. Though Lawless may not have specifically intended it, he all but perfectly prophesied the fall of the Seattle scene as a cultural phenomenon, and provided a telltale warning to the icons and the masses of said scene in the midst of their commercial hegemony of what was waiting for them in the near future. To this day, the author of this review is still awestruck at how the final confession of the Jonathan Steel character on "The Great Misconceptions Of Me" lines up with Kurt Cobain's suicide note, though Steel's account lacks the specific affinities with punk culture and has the audacity to name his own parents as the original culprits of his fate, thus causing one to wonder if maybe Lawless understood the friction that existed between the Baby Boomer generation and their forgotten children better than Cobain himself, or if Lawless' elder and more brazen nature simply gave him the courage to spell it out. It's a timeless testament to the dangers of the Faustian bargain that comes with fame, the harm that parents visit on their children through self-absorbed and tyrannical rule, and a symbolic representation of how only love can save the prodigal son. Perhaps this simply is the lone speculation of a symbol-minded onlooker, but symbols have their place, and this album is one that towers high above the rest.